During the Jewish holidays, the menu often begins with this beloved soup. Every person who makes it has his or her own special touch, whether the herbs or vegetables or how to make the matzo balls. This recipe gives you a head start because you begin with a good-quality store-bought broth. © 2019 Diane Rossen Worthington / Chronicle Books · Reproduced with permission. In a large soup pot, combine the chicken, broth, and water. Bring to a boil over medium-high heat, skimming any foam from the surface. Add the leeks, carrots, celery, parsnips, mint, and tomatoes. Partially cover, reduce the heat to low, and simmer for about 30 minutes, or until the chicken is cooked through and the vegetables are just tender. Periodically skim the foam from the surface. Season with salt and pepper. Remove the chicken from the soup and let cool slightly. With your hands, remove the meat from the bones, discarding the bones and cartilage. Tear the chicken into bite-size pieces and return to the pot. Cover and refrigerate. To make the matzo balls, in a medium bowl, whisk together the fat and eggs. Add the matzo meal, herbs, and salt and stir well. Add the seltzer water and mix well. Cover and refrigerate for 30 minutes, or until the dough thickens. Fill a large, wide pot three-fourths full of water. Bring to a boil over medium-high heat. To shape the matzo balls, using your hands, roll the dough very lightly into 1 1/2-inch balls. (The more you roll them, the tougher and heavier they will become.) Reduce the heat to medium and drop the balls into the barely simmering water. Cover and cook for 25 to 30 minutes, or until cooked through. Remove the matzo balls to a bowl and set aside. To serve, remove the soup from the refrigerator and carefully lift the fat layer from the surface. Reheat the soup over medium heat for 15 to 20 minutes. Taste and adjust the seasonings. Add the matzo balls and cook for 3 to 5 minutes, or just until heated through. Serve the soup in large bowls and garnish with the parsley. Advance Preparation: Make the soup up to 3 days ahead, cover, and refrigerate. 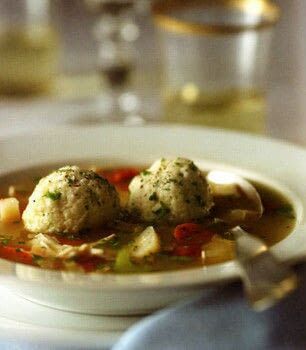 Make the matzo balls up to 4 hours ahead, cover, and keep at room temperature. The Clever Cook Could: For a lighter version, strain the soup and serve only with the matzo balls. Reserve the chicken and use for making a chicken salad.